This morning The Declination was subject to a DDoS attack, I think. 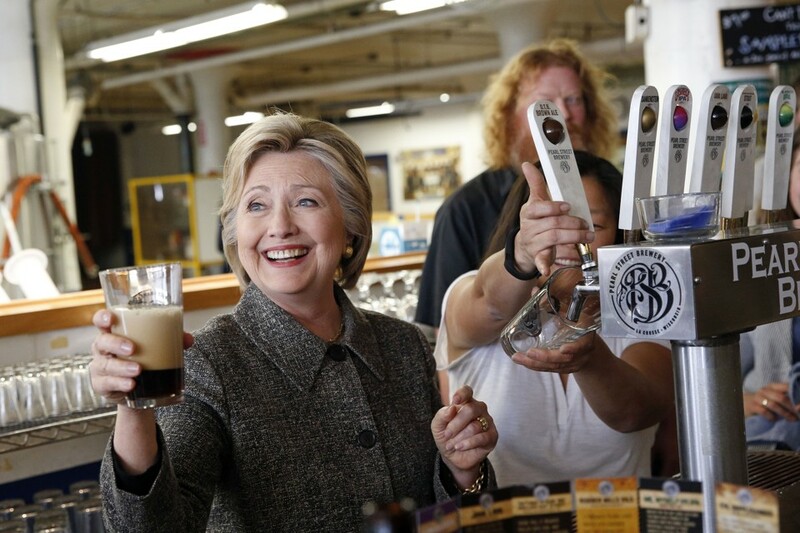 It’s hard to tell, but the server was very unresponsive. So if it goes down again later, that’s probably why. I have no idea if the attack was related to my release of this meme, or if it was just a coincidence. Attacks on The Declination are not entirely infrequent. Bookmark the Youtube video and/or Imgur album and share those. This was certainly a fun project for me, even if a lot of work to remix and remaster the song. I had some help in the form of Jim S., the “Basilisk”, the Dread Ilk, Marina F. and, of course, Tom Kratman himself. Share it, spread it, and trigger a liberal today! 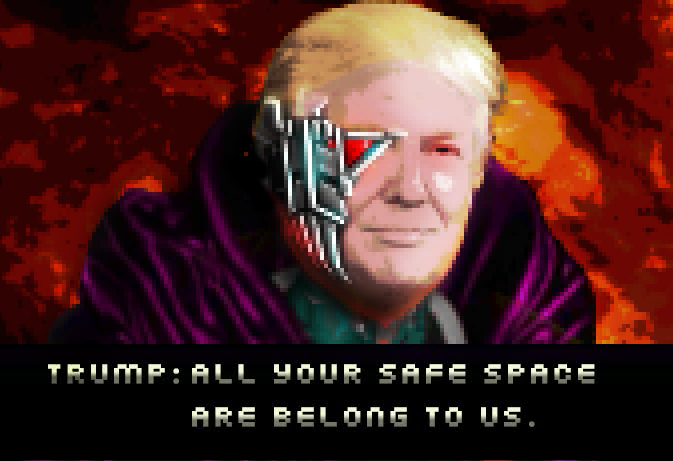 For Great Triggering! Yeah, the title is long. The post will be mercifully short. All I can say is, thank God I am not a Canadian MP. My language would trigger Miss Cat Lady into conniption fits. For our second display of Progressive idiocy on this Monday, November 28th, I present the following: Charles Johnson of Little Green Footballs, a blog that, many moons ago, once made a lot more sense than it does today. 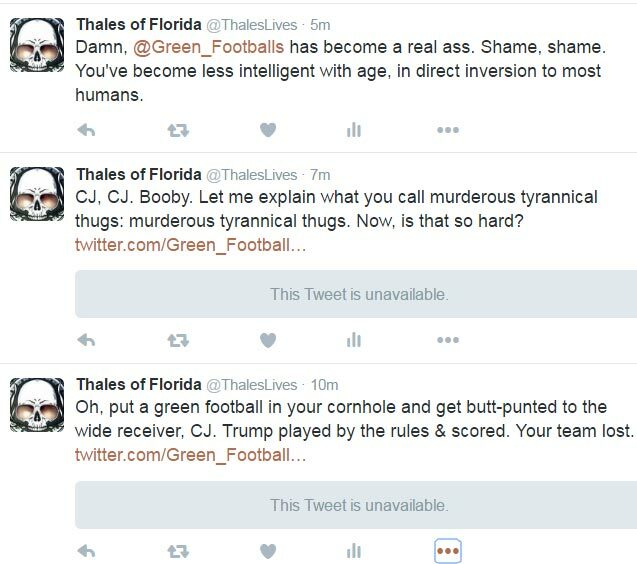 Ole CJ used to be something of a center-right kind of guy, until he had an epic meltdown that resulted in the banning of something like 75% of his readership (including yours truly). Feel free to go to his Twitter to see the originals – blocked from my feed. He was taking offense that Trump said “assholish” things about Castro. He was also hurt that Hillary lost. The problem? Machete-wielding guy had no gun. He tried to run people over, and resorted to the machete after crashing his Honda 4-banger. The gun graboids were practically drooling… and were resoundingly disappointed by the result. Also, said terrorist turned out to be a Muslim Somali immigrant, instead of the militant Amish gun owner the media was praying for. 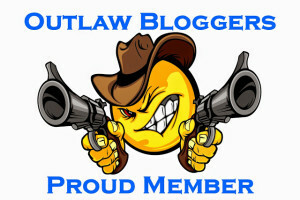 My good friend Nicki has dissected this in detail over at the Liberty Zone. I highly recommend it. Long have we suffered under the yoke of the white-skinned Elves. Indeed, they have oppressed Orcs of Color (OoC) for all of the ages of Arda. Orcs, Goblins, and Men of the East have been enslaved and oppressed for generations, having their wealth stolen from them by the Elves and their treacherous Numenorian allies in Gondor. Did you know that the men of Gondor once had a land of their own? Numenor it was called, but they were not content with it and so the Imperialists colonized and oppressed Orcs of Color. 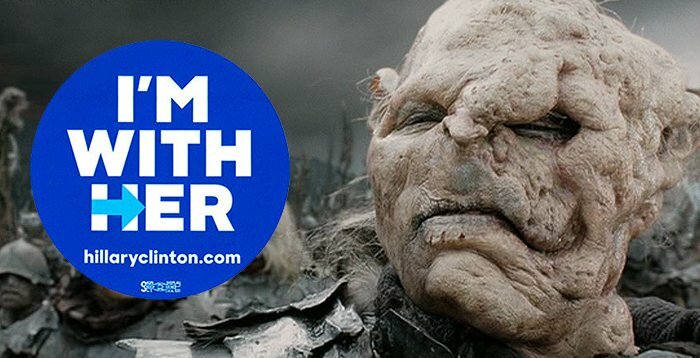 Orc Lives Matter! Enough of this bigotry and hate that the white Elves and white Numenorians spread! Then, through poor environmental management, why, the Numenorians sunk their own island! 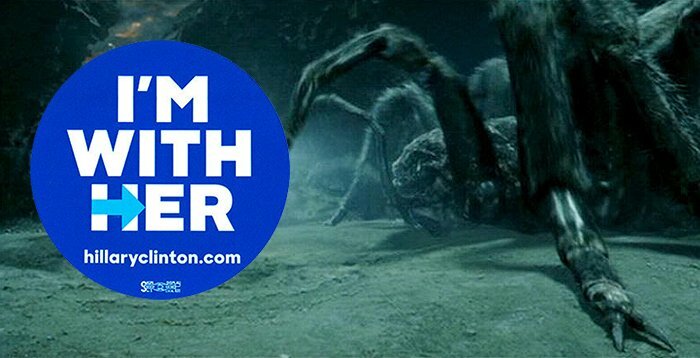 And now they come to Middle-Earth and pollute the environment from their capital of Minas Tirith. Mount Doom continues to spew toxic waste into the air because Aragorn refuses to give Sauron back the One Ring, which was forged to provide a stream of carbon credits to offset the pollution of the mountain. 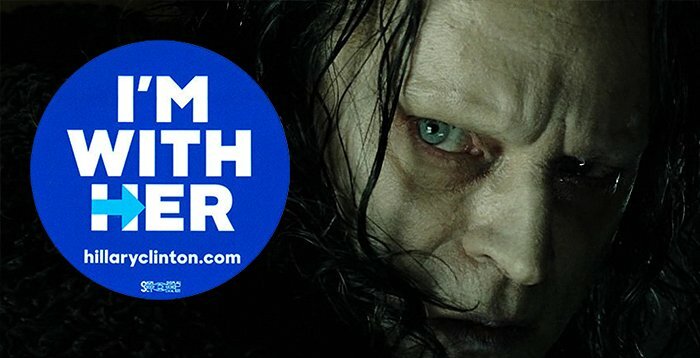 So the dark days are the fault of Gondor. We want to fight against bigotry, oppression, and Climate Change. 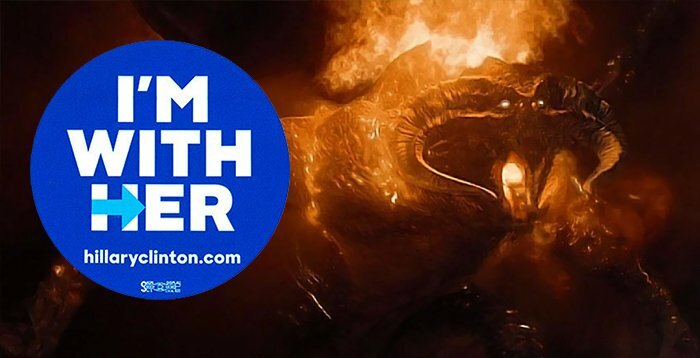 And for that, we need the One Ring. 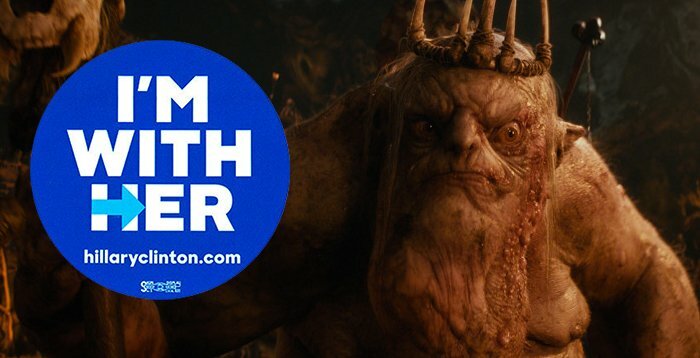 Only one candidate for the Supreme Leader of Man offers to mend this grave injustice, these centuries of enslavement and oppression of orc kind. 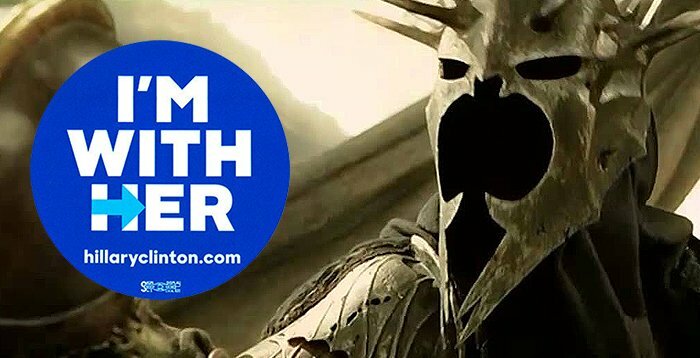 Sauron the Great bids thee to vote for Hillary Clinton! 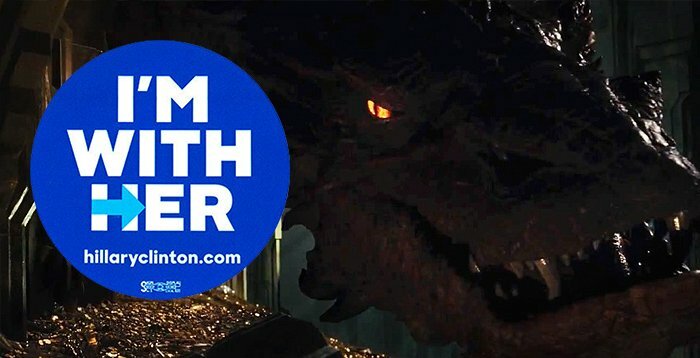 “Hillary understands that we dragons are creatures of peace, love, and understanding,” says Smaug. 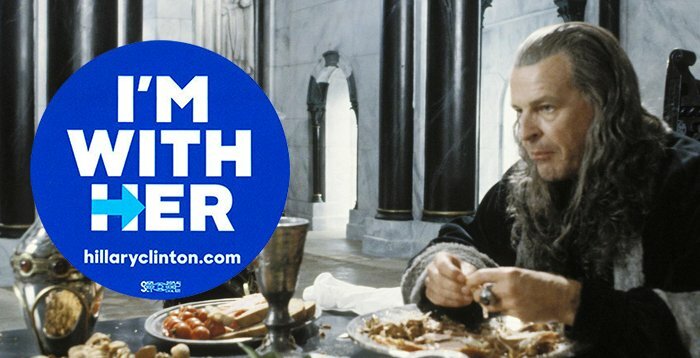 Poor Denethor has been terribly maligned by the upstart, so-called King of Gondor, Aragorn. 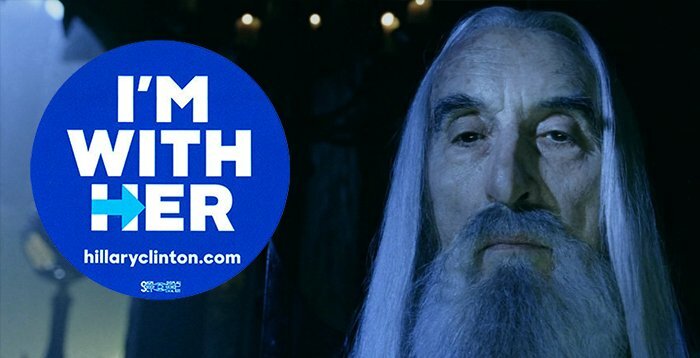 Hillary understands that Gondor needs a caring, kind-hearted Steward with real political and leadership experience, not some warmongering populist ranger from the north. 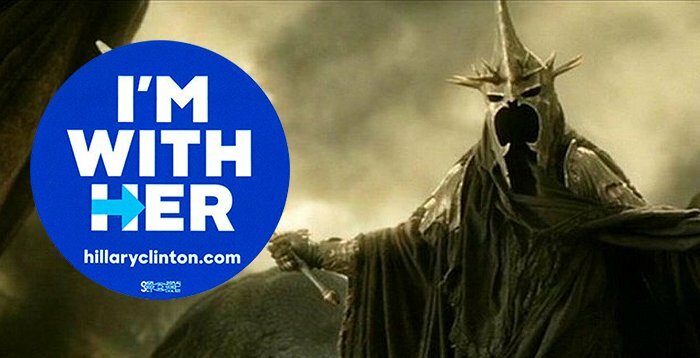 RingWraiths have been unfairly painted by racist, bigoted Republicans as committing more crimes than the average resident of Middle-Earth. While technically true, it unfairly omits the oppressive activities of the Elvish Patriarchy, which has continually impoverished them and kicked them out of their homes. Why, RingWraiths are driven to crime by poverty and extreme circumstance, not because they are innately violent. 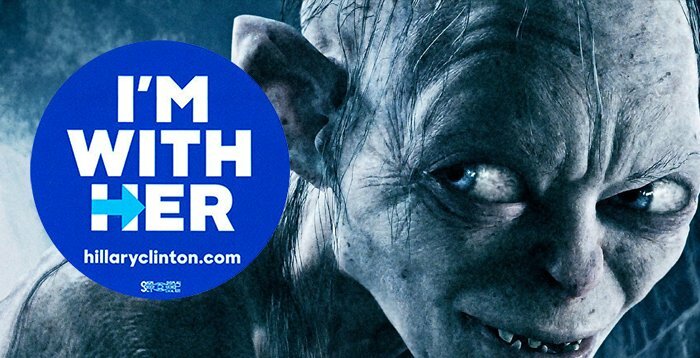 Cave Trolls for Hillary: “Hillary good. Humans tasty [something unintelligible]. They are painted as dumb brutes by ableist Right-wing ShitLords because of their cognitive disabilities. But this is only because the bigots can’t see past the low math scores to the loving, kind-hearted souls within. 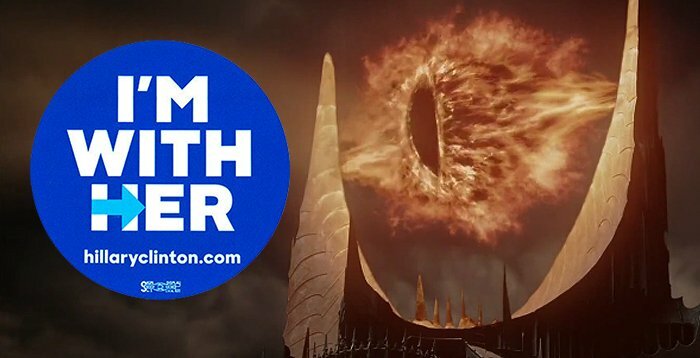 He forged a great ring, designed to fight bigotry, hate, and Sauronophobia. And what did the racist white Elves do? They stole it! “In the Dead Marshes, we have been forgotten and disenfranchised by Republican bigots, who care nothing for the life-disadvantaged,” one resident of the Dead Marshes explained. “Yeah, we even light candles to light their path, and the wingnuts don’t even come down to say hello. 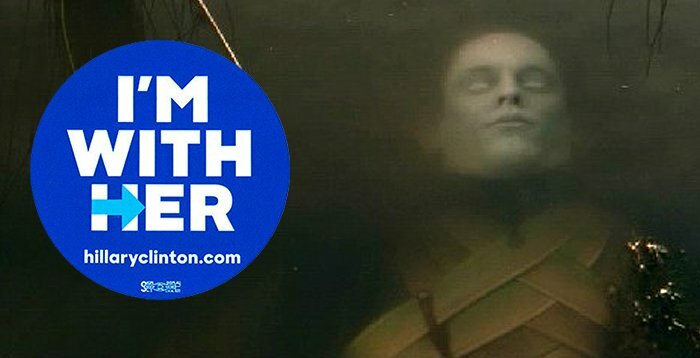 It’s like they think they are too good to hang out with dead people,” another answered. 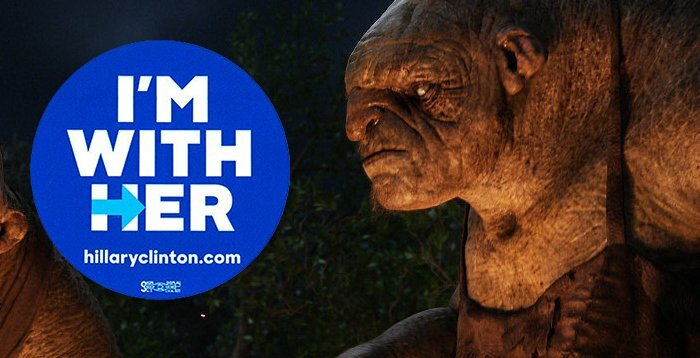 Our reporters tried to get in contact with the Trolls again, but it turns out that Bilbo Baggins had turned them all into stone! Such closed-minded bigotry! These poor, gentle creatures will never strip the flesh of racist, sexist homophobes to the bone again. A candlelight vigil will be held next Thursday in memory of these loving souls and fighters of the White Supremacist Patriarchy. 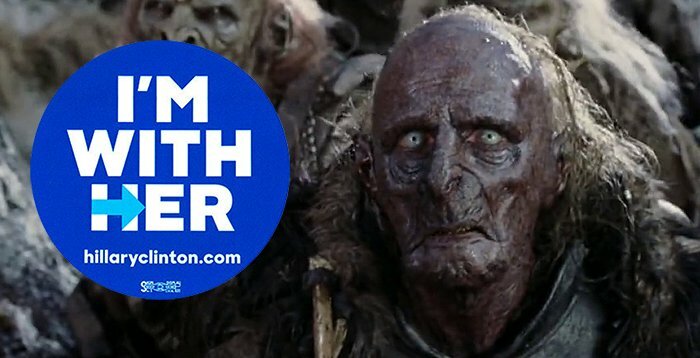 “It’s not right,” the Uruk Hai said, declining to be identified. “We’re always so hungry, and the Rohirrim won’t share their flesh with us. How come they get all the flesh? It’s just the 1% again, taking all the wealth. 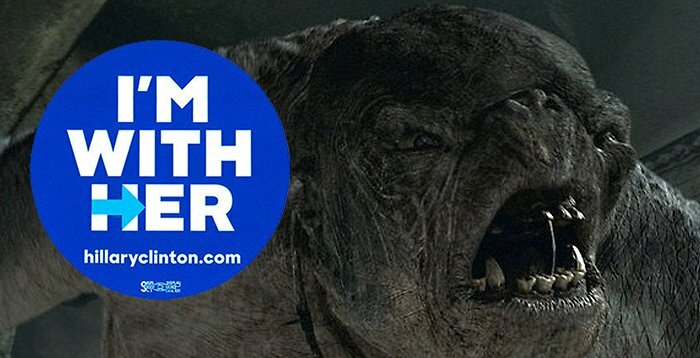 We’re just trying to raise our children, beautiful Orcs of Color, and these citizens of Rohan go on about, warmongering, and starving us. We want better wages! We want to be paid in flesh! 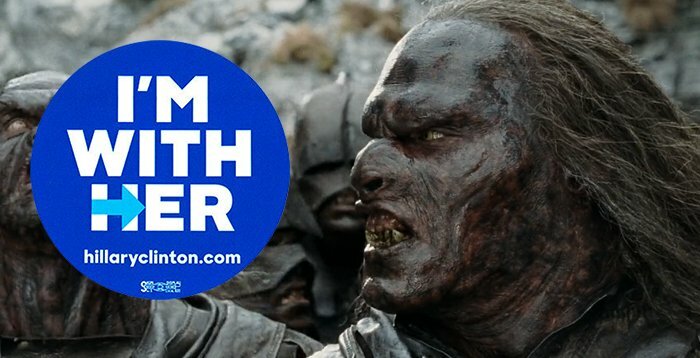 So we’re going to Helm’s Deep to strike and demand our rightful due.” The Uruk Hai claimed to be a member of the Isengard Worker’s Union, Local 666. The Witch-King’s speech impediment sabotaged the rest of the interview — WE INTERRUPT THIS CAPTION TO NOTE THAT THE ABLEIST REPUBLICAN WHO WROTE THAT HAS BEEN SACKED — the beautiful music coming from the Witch-King of Angmar soothed our souls, even though it sounded like a bag of cats being banged together repeatedly — SORRY THE RACIST WHO REPLACED THE MAN WHO WAS SACKED WISHES YOU TO KNOW THAT HE HAS BEEN SACKED — The beautiful wraith of color had no further comment. 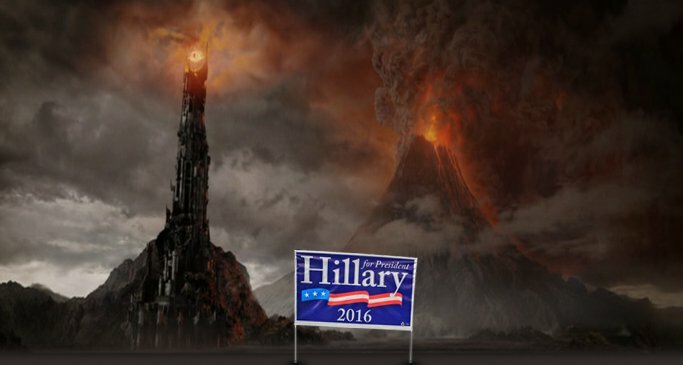 And so our interviewers have determined that the realm of Mordor, a bastion of animal rights, climate change activism, hope, change and inclusiveness will most likely favor Hillary Clinton. 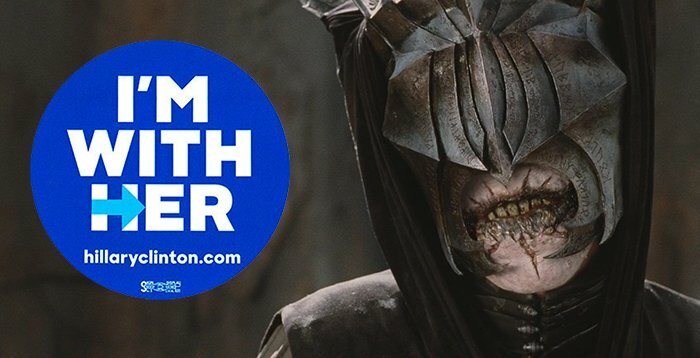 It is said that through pure voluntary community organization and grassroots efforts (no coercion of any kind), early predictions indicate a 100% favorability rating for the Witch-Queen of New York in Mordor, Mirkwood, and other areas where Sauron is seen not as a Dark Lord, but as a liberator for the oppressed peoples of Middle-Earth.